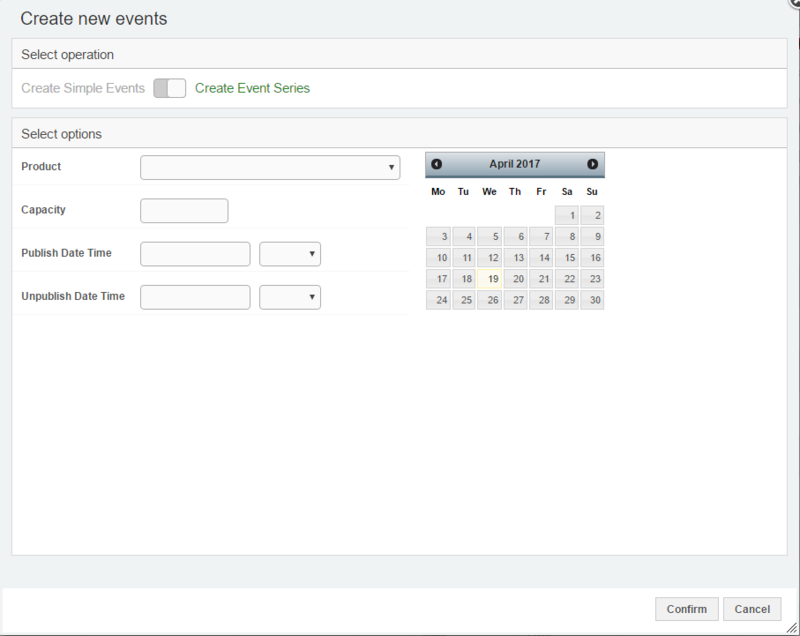 The Create Event Series action allows you to create a series of Events that fit a regular weekly pattern. 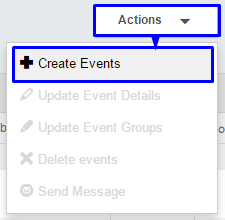 To use the Create Event Series action, click on the Actions dropdown to the top-right of the Events table, and then select Create Event Series option. 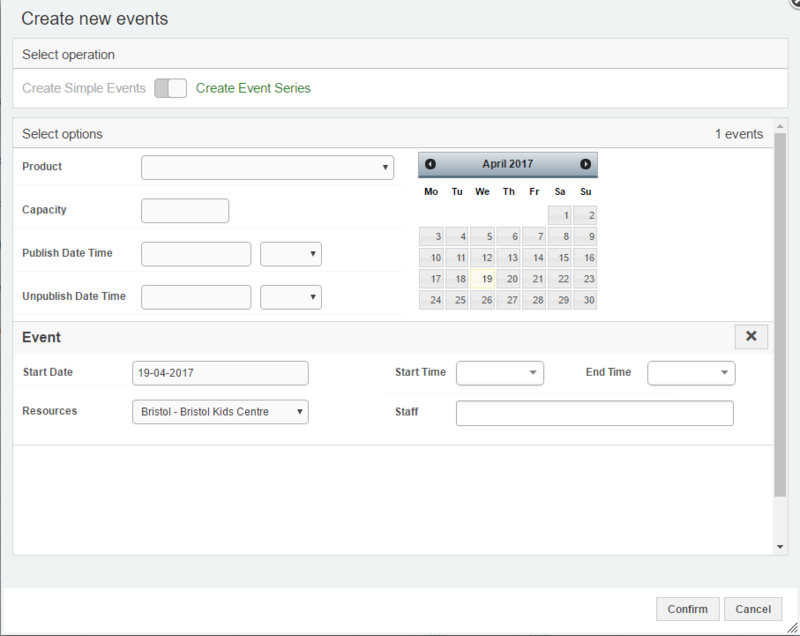 If you then select an addition date from the Calendar, you will be provided with an additional date. If you have set a Start Time, End Time, Resource and Staff in your first event, this will be carried across to any additional Events you create. The Product that is being used for this event. *Note:* only Multi-Event products are shown. The date and time that the Event Series will be Published. The date and time that the Event Series will be Unpublished. (dd-mm-yyyy) The date of this event. *Note:* this can be edited after selecting the date initially. (hh:mm:ss) The start time of this Event. (hh:mm:ss) The end time of this Event. You can choose Staff/Users who are involved in this Event. You can remove Events from the list by clicking on the X icon beside the Start Time for the Event in question. Once you have completed all of the relevant options, you can then click on the Confirm Button. 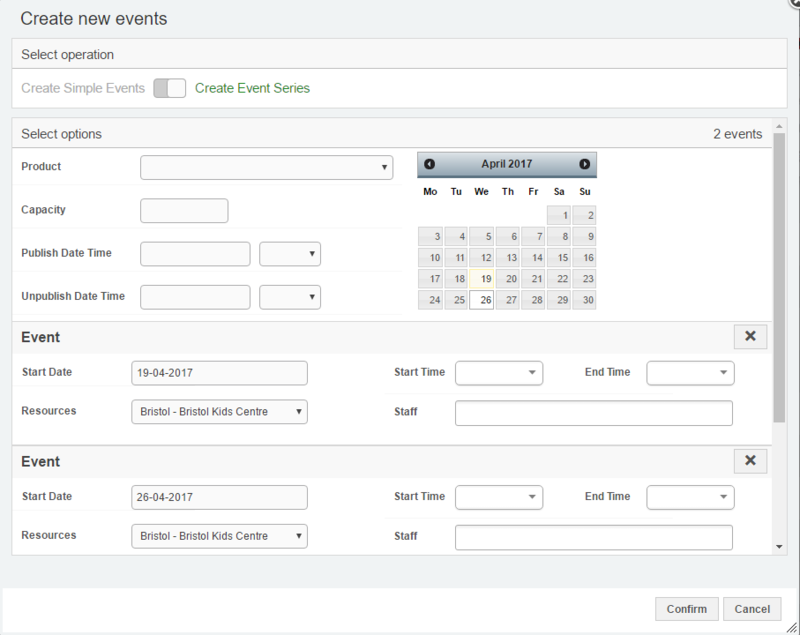 The system then creates the required number of Events based upon your options. This can take a while, depending on how many Events you have created.